Chen Mapo Doufu restaurant in Chengdu. 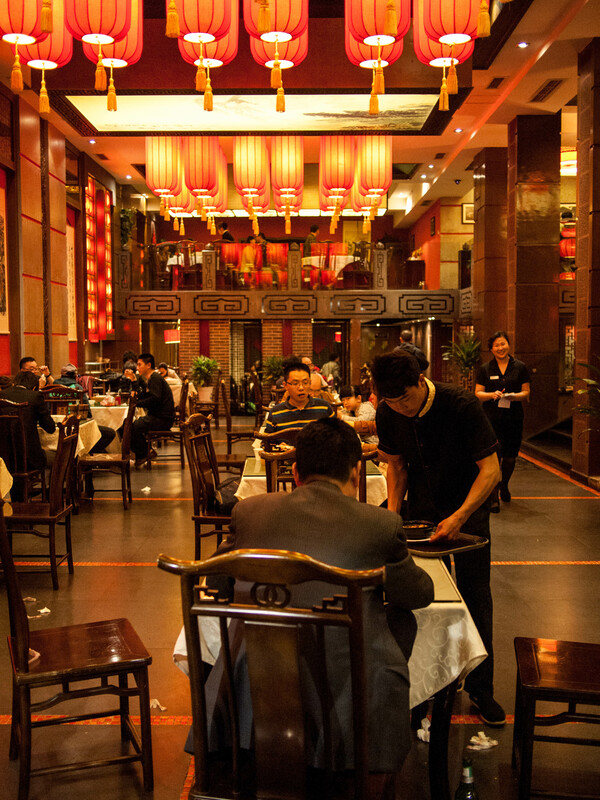 Chengdu is a wonderful city for eating. 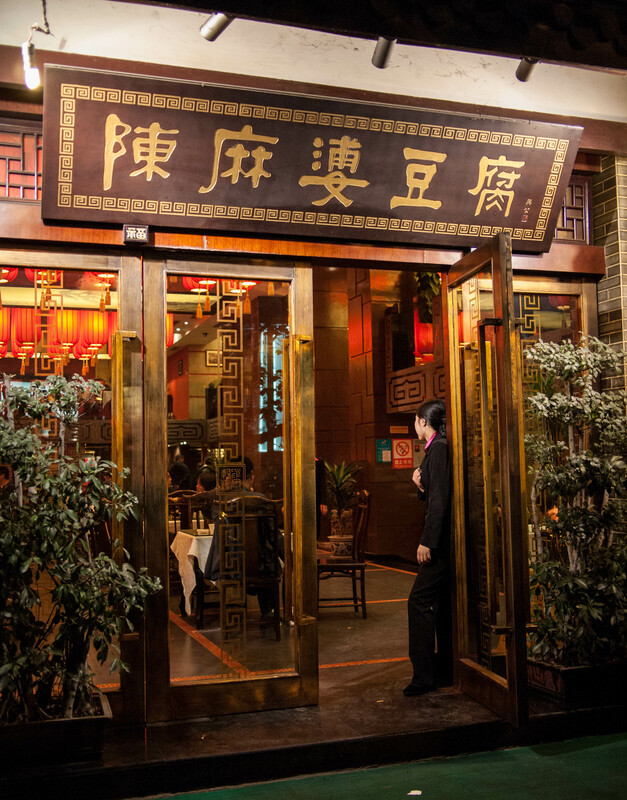 It is one of the great culinary centers of China and the heart of Sichuan cuisine (川菜 chuāncài). 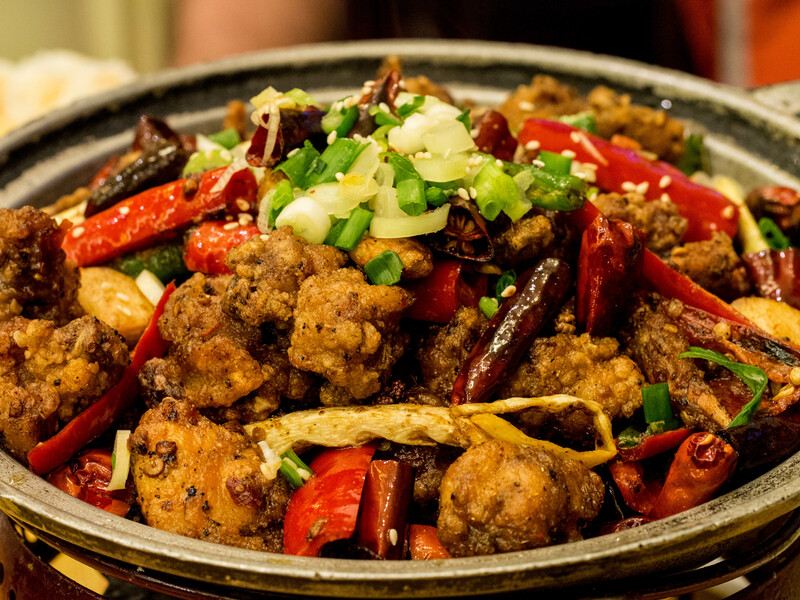 Sichuan cuisine is mostly known in the West as the spicy food of China. 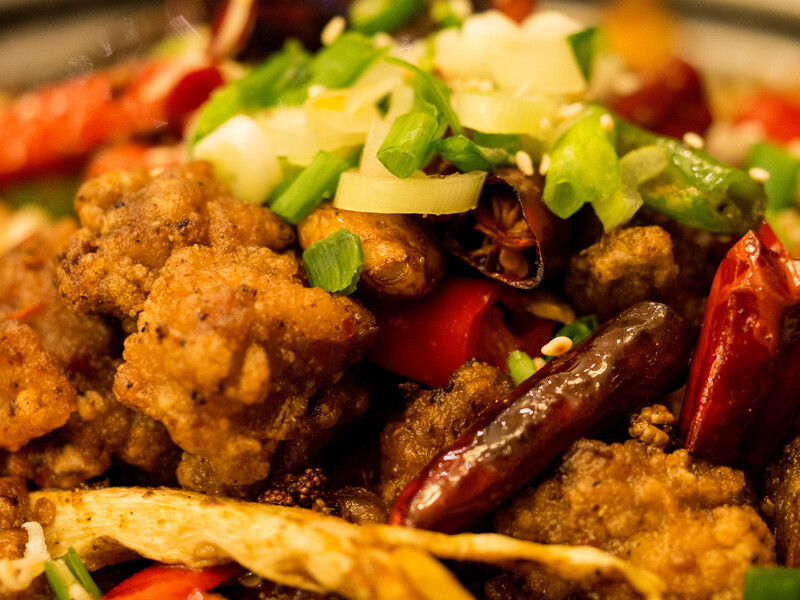 It is true that there is some truly spicy food here, but it’s not all about chili peppers. There are quite a few dishes that have no heat at all. But the most famous dishes tend to be pretty spicy. 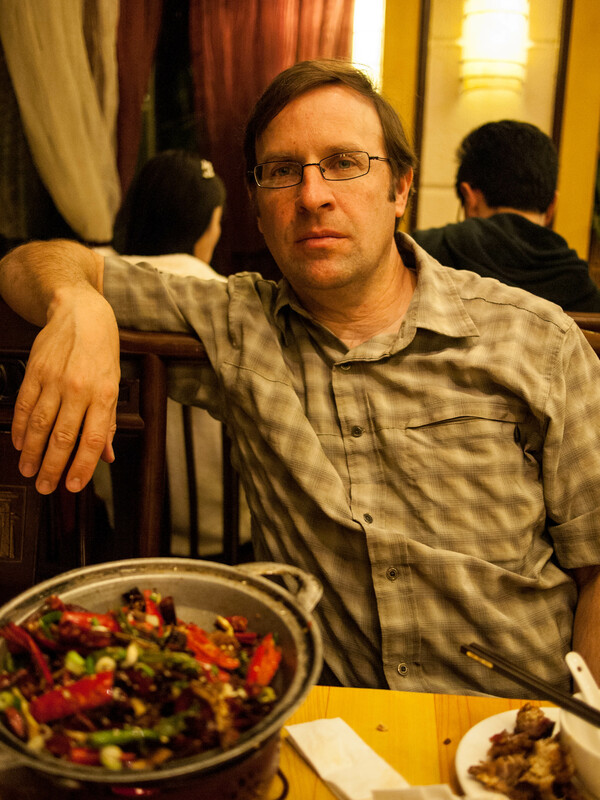 In April my friend and colleague and I spent a week in Chengdu doing research on Sichuan cuisine. The research was rigorous and demanding requiring us to eat as many Sichuan dishes as we could in the short time that we had. Our first evening in Chengdu we went to the restaurant 陳￼麻婆豆腐 chén mápó dòufu (Chen’s Mapo Tofu). 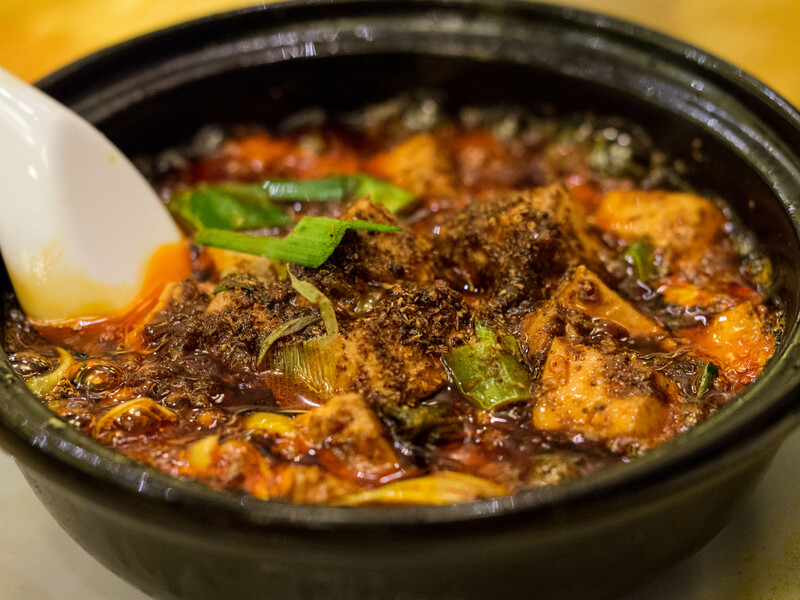 This restaurant has been around since 1862 and claims to be the originator of the famous Sichuan dish, Mapo Doufu, a spicy tofu dish. We had read about this restaurant and wanted to give it a try. 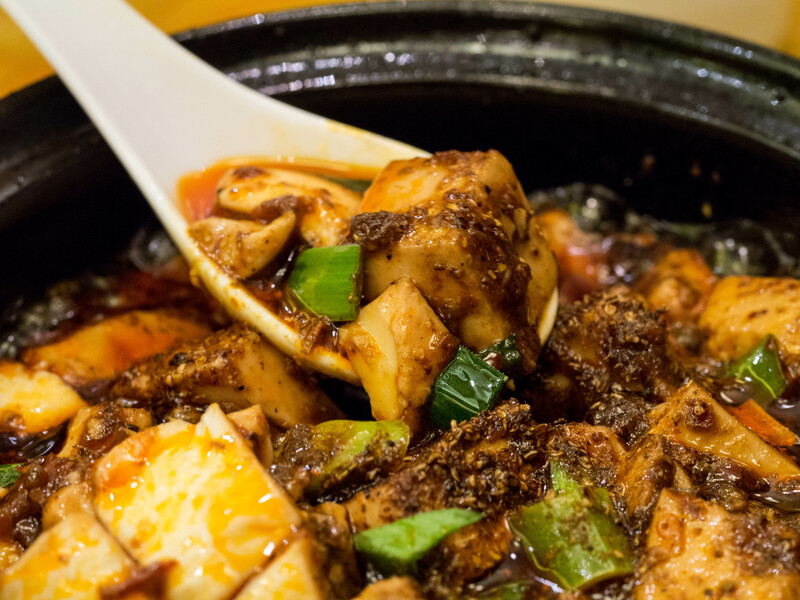 We are both quite fond of Mapo Doufu and I have eaten it all over China, but never at its source. We had a very memorable meal. All five dishes that we ordered that night were excellent and I still think of that spectacular meal. Below I describe each of the five dishes that we ordered. What made this Mapo Doufu different from all others I have had was the Sichuan pepper or 花椒 huājiāo. This is sometimes translated as prickly ash. It isn’t a true pepper. It is a seed that grows on a bush. The husk is dried, ground, and added to dishes. It produces a numbing heat that the Chinese call 麻辣 málà literally meaning “numb-spicy.” It really does numb your lips, tongue, and mouth. It is a very pleasant sensation, though many Westerners don’t like it. This particular dish had a great deal of Sichuan pepper mixed into the dish, as well as quite a bit of freshly ground Sichuan pepper sprinkled on top. It was very numbing. The dish also had just a bit of ground beef to give it a fuller flavor and it was swimming in hot red chili oil. It was quite salty and as I mentioned very spicy, both in the traditional sense and the numbing sense. You can see the freshly ground Sichuan pepper. This was a dish that was not spicy at all. 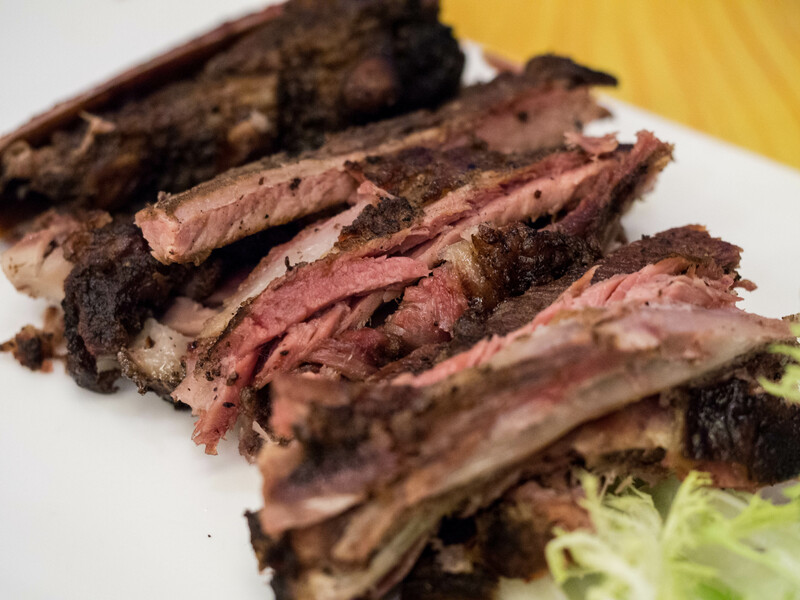 These pork ribs were smokey and meaty, seasoned with black pepper and maybe just a hint of ginger. The meat was very tender, literally falling off the bone. And the flavor was deep and rich. 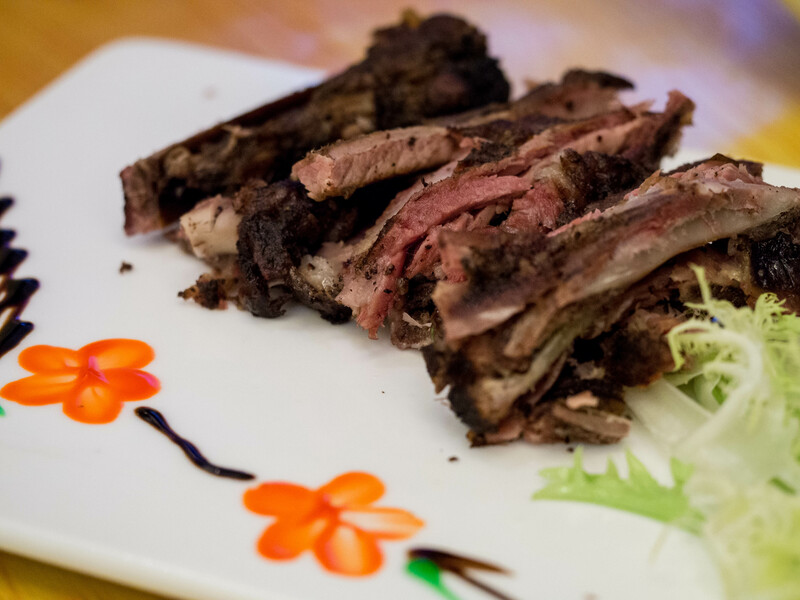 We really enjoyed this dish, and it was so different than your typical Chinese dish. We could have eaten two more plates of this delicious dish. This is the kind of dish that you wake up in the middle of the night thinking about. A true revelation of Chinese cuisine. This dish was spectacular. From the first bite we were transported to some culinary place we had never imagined. These small pieces of bone-in chicken are deep fried, then cooked in a dry iron pot with the other ingredients. This dish contained whole cloves of garlic, baby bamboo shoots, scallion, lots of dried red chilis, and Sichuan pepper. This chicken had so much flavor—fiery, salty, crispy. It was truly remarkable. This was another dish that we felt like we could eat very night. We had never had fried chicken like this before. 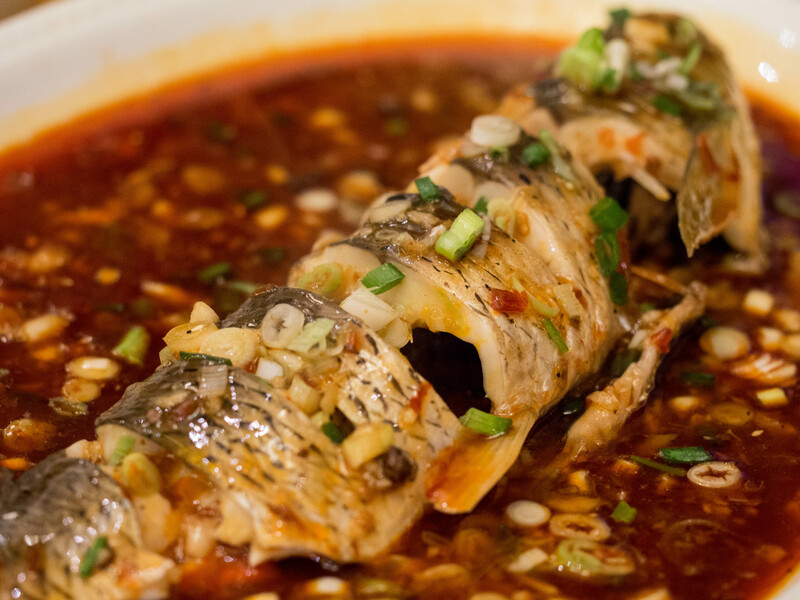 A type of sweet and spicy fish. I’m not really sure how to translate this dish, but who cares, it was delicious. 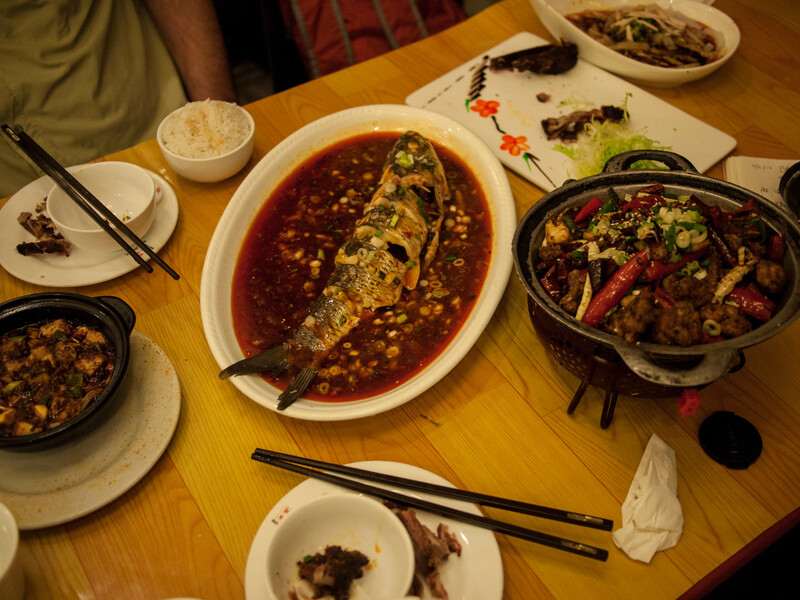 The Chinese typically serve fish whole, that is with the head and tail intact. And why not, the tastiest, most tender part of the meat on a fish is right behind the gills. 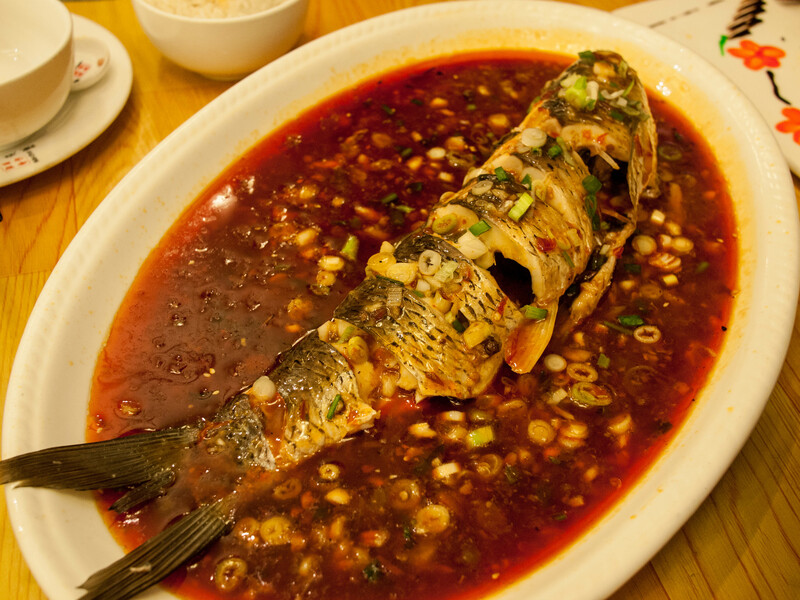 This fish was steamed then smothered in a sweet and spicy sauce with chili pepper and scallions. It was not that spicy and there was that nice sweet contrast to the chilis. The fish was very tender and the mellow flavor of the fish was nicely enhanced with the rich flavorful sauce. I like fish and I really liked this dish. It was exceptional. There are quite a few cold dishes served in Sichuan cuisine and this was a good one. 凉粉 liángfěn are a bean noodle typically served cold. They are thick and chewy with a light delicate flavor. This dish was seasoned with chili oil, sesame seeds, scallions, and a little minced garlic. On top was shredded chicken just lightly salted. The coolness of the dish was a nice contrast to the other hot dishes. 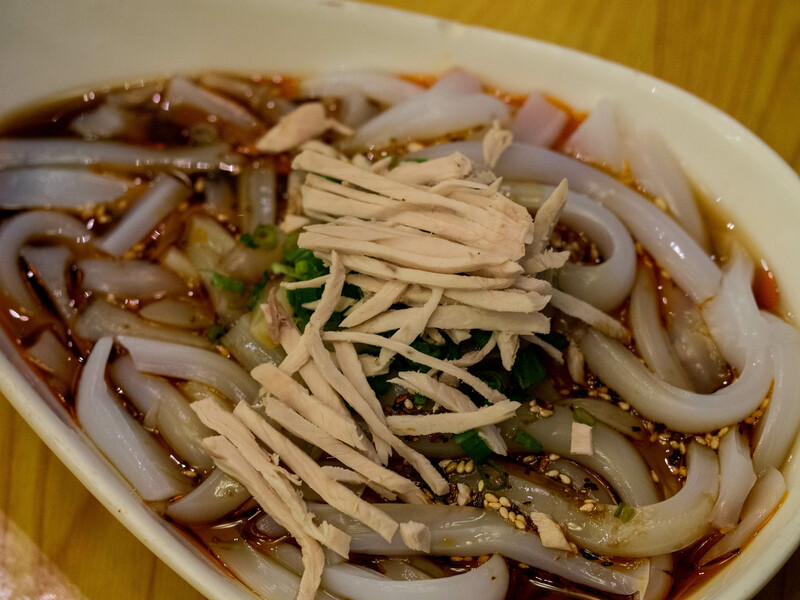 Noodles are pretty important in Sichuan cuisine and there are noodle shops all over Chengdu. Noodles are a traditional fast food in China and in Sichuan they take their noodles pretty seriously. As we finished this meal (and no we could not finish it all) we were reeling, intoxicated with the rich flavors of these dishes. Our mouths glowed from the heat of chili peppers and Sichuan pepper. Outside it was a cool evening, drizzling softly and this was just the beginning of a memorable few weeks eating in Western China.